I don’t want to draw a blobfish! Back a couple of years ago, I got the strangest manuscript. It was called Blobfish!, written by Julie Segal-Walters, and I didn’t have a clue what it was about. It was kind of a book about animals, it was kind of a meta-book thing where the illustrator and author get into a spat about how the book is supposed to go, and it was pretty funny. I signed on, and went about worrying about it for months. Usually, when I decide to illustrate a book, I have some idea what the book will look like. It’s usually clear why someone asked me to work on it, and I can see pretty quickly what I want to do with it. This one was an exception. Even my agent, in his email to me about the script, said it was weird. Time went by, and I worked on other commitments, occasionally sketching from this story, and occasionally talking to the editor about what we might be doing with it. Julie made some revisions to the script, I stared the process of laying out the page-breaks and finding the story’s rhythms, and things started to fall into place. Well, today is the book-birthday for the resulting picture book. Now it’s called (This is Not a Normal) Animal Book, and Paula Wiseman Books / Simon & Schuster has it available today for you to order up and read aloud to your kids, you partner, or yourself. I’m pretty happy that we even got to have the “fake” cover as the case-cover here. The idea, of course, being that the illustrator sabotaged the jacket cover. Matthew Winner, he who makes the All the Wonders podcast interviewed Julie and me a few weeks ago, and today that conversation went live. You can listen to us here. This is a very different book than anything i’ve ever made. There are drawings in it, of course, but there are also pages and pages of cut paper, and crayons, and scissors, and sketches. My art studio became a photography studio for a week last year while I was photographing these objects. I even had jars of jelly (you’ll see why). So, go get it. I think it’s hilarious. The sixth book in the Tinyville Town series is out today, called “I’m a Police Officer.” It follows our hero, Kathy, as she walks her beat, solves a crime, and generally keeps the citizens of Tinyville Town safe. It’s available today at a bookseller near you. I also want to point out that it’s dedicated to my good friend from high school, Jennifer Coffelt of the Houston Police. Because she’s awesome. 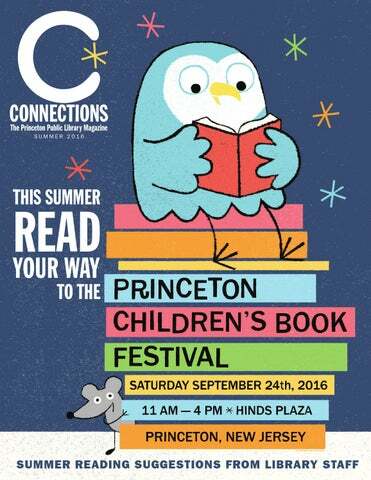 I first attended the Princeton Children’s Book Festival about three or four years ago and thought it was just terrific. Four big tents full of people reading, writing, illustrating, and especially buying books. I was set up next to Jon Scieszka where we were writing our names in copies of Frank Einstein, and I’ve been back each year since. I was especially pleased when they asked me to make the poster for this year’s festival, which will be on September 23. I’d seen the posters that Peter Brown, Dan Yaccarino, and Greg Pizzoli made, and figured I better work hard on this one. So… it’s time to reveal this thing. I’m also posting a few sketches from the process that led to the final design. Please enjoy thanks, and I hope to see you on September 23 in Princeton, NJ. Thanks to Susan Conlon, Caroline Quinones, and Tim Quinn for the opportunity and the help throughout the process. I’ll be working on the rest next week. The festival itself is Sept 23. Recently designed a couple of posters for some bike events that i’d like to show off. One is for a ride taking place this weekend called Lu Lacka Wyco Hundo. It takes place over three counties in Pennsylvania, Luzerne, Lackawanna, and Wyoming (“Lu Lacka Wy Co”) and is more or less 100 miles long (Hundo). I’ve ridden it the last two years and I’ll be at it again on Sunday. These posters were printed by Ralph Stollenwerk at Pinkbikeralph here in Philly, and they look so good. They’re only available for riders, and have already sold out. The second ride takes place in the fall, up near Williamsport PA and is called Keystone Gravel. It’s about 65 miles, and was the center of my favorite weekend on bikes last year. “Chainsaw” Donnie Breon puts this one together, and got in touch with me looking for a flier. I’d originally designed these two posters with Lu Lacka in mind, but when we went with the map idea instead, I told Donnie I had a better idea. There is a “his” and a “hers” and they look good hanging on the wall next to each other. These two are for sale on Etsy, together or separately, and will be printed by me mid-summer. Here is a link to an album of pictures I took last year at Keystone Gravel. And lastly, here’s a picture of me just after finishing Keystone Gravel last September, taken by the mighty Abe Landes of Firespire Photography. the Noisy Night pajama party book tour! On March 7, I leave the comfortable environs of Philadelphia to travel across the USA in my pajamas with Mac Barnett, talking about and writing our names in copies of Noisy Night, our book that is being released by Roaring Brook Press the same day. The tour begins in Plainville MA, at An Unlikely Story. We make our way back down to Philadelphia on March 9 (my birthday! ), where we’ll be at my home away from home, Childrens Book World, in Haverford at 4:30pm. On the evening of March 10, we’ll be at the Takoma Park Library in Takoma Park, MD. On March 11, we’re at Politics & Prose in Washington DC at 10am. We then leave the east coast and head to beautiful downtown Kalamazoo, MI, to Book Bug for an afternoon party. Lastly, we go way out west to Santa Cruz, CA, to the Bookshop Santa Cruz at 4pm for the final event of the tour. Since I love Santa Cruz, I’m staying a few extra days to ride bikes and eat tacos. Hope to see your face along the way! Here’s the website for Noisy Night. And here’s the trailer video for the book. In the publishing business, books have birthdays, and today is Tinyville Town’s. The series is officially “published” today, and you can ostensibly get it in your local favorite bookstore. I’m hoping this series has a lot of book birthdays over the next several years. The series debuts in a week, on September 6. Abrams asked me to use the little Time-lapse video I made last year when I drew the cover of Gets to Work. I tacked on some bumpers and branding, and changed the soundtrack. Greetings from Tinyville Town from Brian Biggs on Vimeo. Super-blogger and librarian Betsy Bird wanted to talk to me about Tinyville Town recently, and put together some really good questions about the series and around some more general children’s book topics, like gender roles and the idea of “timelessness.” The spark that became Tinyville Town came from my literary agent, Steve Malk, but the ingredients had been cooking in my head for some time, and I was happy to mix it up a bit. I don’t often think of myself as one of those children’s book authors with an axe to grind or anything, but as I raise and send these kids of mine into this sometimes backward world, I realize that words have formed in my head. Please enjoy, and feel free to comment. The fourth book in the Frank Einstein series is hitting bookstore shelves on September 6, and I got a box of the lovely things in the mail this week. This time, the focus is on biology and evolution. Frank, Watson, and the robots are camping while doing their science thing and saving the world from T. Edison and his simian sidekick. Four down, two to go. Everything here is copyright 1998 - 2019, Brian Biggs. Atom (RSS) and Entries (RSS) and Comments (RSS).